A gluten-free pecan pie recipe will be a welcome surprise for everyone at your dinner table. 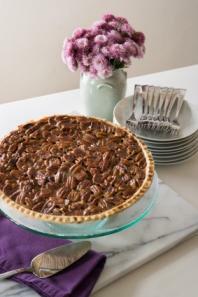 Pecan pie makes a delicious dessert during the winter holidays, or any time throughout the year. Many pie recipes, can be easily modified so gluten-containing ingredients are not used. Since pies do not have to rise like other baked goods, almost any gluten-free flours can be used to substitute regular all-purpose or wheat flour for most recipes. Note- If you do not have brown rice flour for the following recipe, feel free to replace it with any gluten free flour. Just remember that while the texture will not be affected, the flavor may be if you use a more intensely flavored gluten-free flour such as buckwheat flour. Using a pastry blender or your fingers, cut the shortening into the flour until it resembles a crumb-like texture. Use your hands to work with the dough until it becomes soft. Press the dough into an 8-inch pie pan. Press the dough evenly across the bottom and sides of the pan, using a spoon or your fingers. Decorate the edges as desired. Prick the bottom of the crust with a fork. This prevents the pie crust from buckling during baking. If you feel that you don't have the time to make your own pie crust, there are plenty of wonderful mixes available for you to purchase. This filling is quick and easy to put together. Most pecan pie fillings are gluten-free, so feel free to substitute your favorite filling if you would like. Add the remaining ingredients and combine well using a wooden spoon. Pour the pie filling into the pie shell. Bake for 20-25 minutes, or until the filling is set. Maple Pecan Pie with Oat Crust from Recipe for a Gluten Free Life by Mrs. G.
Once you get used to making gluten-free pie crusts and fillings, you will find that there are endless options when it comes to making totally delicious gluten-free desserts. It only takes a little practice and patience to master this simple and rewarding technique.